Worcester centre Ben Te'o has been ruled out of the England tour of South Africa with an injury to a quad muscle in his leg. Te'o, 31, requires surgery on what is being described as a "minor" issue. Gloucester full-back Jason Woodward, Northampton centre Piers Francis and Wasps number eight Nathan Hughes have been called into the 34 man squad. They replace Te'o, and the other injured players Cameron Redpath and Jack Willis, in Eddie Jones' squad. England's tour of South Africa, which features three Tests, starts on 9 June at Ellis Park in Johannesburg. Jones' side have lost four matches in a row - including Sunday's non-cap match against the Barbarians - and last won on 10 February against Wales in the Six Nations. Te'o has played 13 times for England and last featured against Ireland at Twickenham in March. The former rugby league player only appeared 12 times for Worcester last season and travelled to Australia during the campaign to undergo a self-funded rehabilitation programme after having a plate inserted in his ankle. 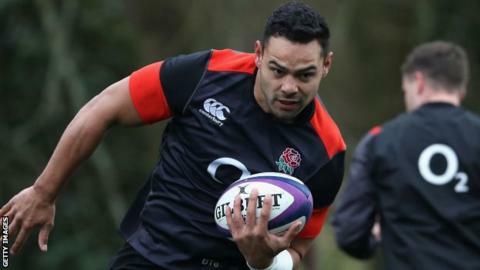 Te'o becomes the latest England player to leave camp injured, although the RFU says the centre has aggravated an existing injury and now needs "minor repair" to his quad. Either way, it means England will have a new-look midfield at Ellis Park, with another stalwart Jonathan Joseph also missing. Alex Lozowski - a class act at Saracens this season - now has a wonderful chance of wearing that number 13 shirt come the first Test with the Springboks, while Henry Slade is also a contender.